Compulsory: New rule for clubs. It will be imperative for rugby teams competing at any level in the UAE this season to carry a trade licence. Running a sporting club of any kind in the Emirates requires the licence, with a number of issues like insurance connected to it. 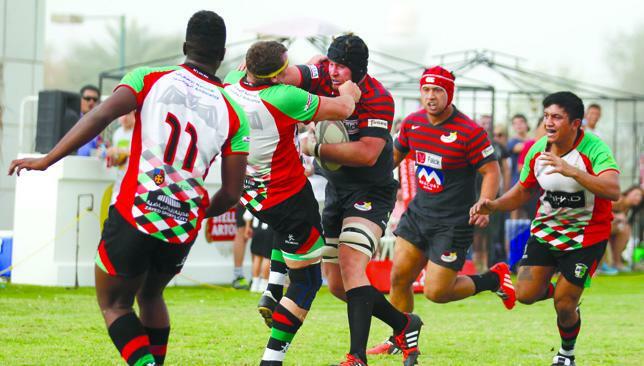 But rugby union teams have in previous seasons been covered by the UAE Rugby Federation. The UAE RF confirmed that any club competing in the UAE Premiership, UAE Conference or the newly formed third tier Community Cup in the 2015/16 season will now require a trade licence in order to operate, although it is believed that to be unrelated to the rugby league furore that erupted in April. Dubai Exiles were said to be the first team to successfully apply for a trade licence, while every team in the Premiership and Conference is reported to have followed suit. Just a few teams in the Community Cup are said to still be in the process of getting one in place. Any team yet to have a trade licence has around six weeks to get one in place. Trade licences first became an issue seven years ago when Dubai Striders – a UAE jogging club – were told they needed one to operate, despite arguing that they had been a club for 15 years. way on Friday, September 18. The UAE Premiership and Conference seasons begin a week later, on Friday, September 25. Sharks' new coaching team Garn (r) and Battley. Dubai Sharks are on the hunt for a permanent new ground and could be about to strike a deal with Dubai Sports City. Sharks currently have a rolling yearly lease at the multi-venue sports complex, but the club are keen to make that a more permanent fixture ahead of the 2015/16 campaign. Boasting a world-class venue and pitch, combined with clubhouse facilities, Dubai Sports City is a key attraction for Sharks and the club are hopeful a deal can be struck before the start of the season. Sharks have played on and off at DSC for the last eight or nine seasons and have a real affinity towards it. They have also played at 7he Sevens Stadium and Jebel Ali Centre of Excellence too, both on the outskirts of the city, but they believe the inner-city venue feels more like home. Pre-season training is already well under way at Sharks, having begun at the start of July, and excitement is certainly building ahead of the new campaign, with Kiwi Dan Gawn and Scot Richard Battley taking up the roles of first team coaches. Sharks finished eighth in the Sport360° UAE Conference last season before going on to reach the Plate final of the post-Christmas Bottom 6 competition, losing to Abu Dhabi Harlequins 2nds 31-20. The Amblers players are put through their paces. Al Ain Amblers chairman Sean Emmett insists the club are not daunted about the prospect of meeting the UAE’s finest in the Premiership next season. Emmett is not about to draw attention to himself or the club by wildly predicting the Garden City club will flourish among the elite, however he also claims his club will be nobody’s whipping boys. Contrary to the name on the badge, Amblers roared mercilessly into the Premiership, taking the UAE Conference by storm. They went the entire 2014/15 campaign unbeaten, winning 16 straight games, capping a memorable season with a 35-15 win in the UAE Conference Cup final against Jebel Ali Dragons 2nds. Victory and promotion was all the more sweeter for the club, having tasted defeat in successive finals in 2013 and 2014. Emmett is aware Amblers will not receive the freedom to play their expansive, attacking game that saw them promoted. But he is looking forward to the challenge they face. “We’re not daunted by the new season, the players are really looking forward to it,” Emmett said. “We’re looking forward to competing with the other teams and we’re hoping for a handful of victories and consolidating our position as a Premiership team. The Premiership will be new territory for Al Ain and former second team captain Emmett is also heading a raft of changes off the field at the club. The 43-year-old has replaced Andre Fourie as chairman, with only new director of rugby Rocco De Bruyn remaining from last season’s committee. Amblers have a new first team coach in Andrew Rouvi, who replaces interim coach Keleto Dyer and last season’s promotion-winning head coach Peter Aki. Emmett sang the praises of Rouvi, who he believes will relish the strategic challenges the Premiership and its teams will pose to Amblers. “Peter said before last season that he wanted to move on so we knew that,” said Emmett. “We started to look for a new coach early and Andrew, who was coach of the seconds, expressed a desire to move up. He was a strong contender. He is a great people manager, he plans meticulously for both training and games.